The Equalizer race is set at Gray's Lake just south of downtown Des Moines. The 1.905 mile path around the lake allows for a nice flat runnable loop. It reminds me of one of my favorite places to run, the chain of lakes in the twin cities. Usually, I can head out to Gray's over lunch and do a nice, easy 5 mile recovery run or I head there to do a few laps of speed work during the week. At most, I think I've run 4 consecutive laps at Gray's - that is just under 8 miles for the mathematically challenged. Really, after a couple of consecutive laps, it can get a little boring. Actual miles, I came in second - equalized miles I came in 5th. For those of you not familiar with the race, yes - one could actually run more miles than you, but because of age/gender, they could beat the snot of you on equalized miles. It is an interesting concept - a male at 36, my factor was 1.02. If you are a 50 year old female, your factor is 1.351 - so you every 3 miles you run, you get credit for just over 4 miles. Yes - Des Moines has many companies devoted to the insurance business. A by-product of that is a bunch of actuaries sitting around wondering about how age and gender have a factor upon miles. Apparently, they believe the factors listed on the entry sheet is the key. I'll leave it up to someone else to verify for me. Race info and factors can be found here. "Any entries received after that date may not receive a race shirt, however, race entry is permitted up until the start of the race. It is preferred that you give us some time to prepare, but if, like BP or the government response to the Gulf oil leak, you have trouble with decisions, you have until 8am on 10/30/2010 to commit." Not much to say about the race for me - I trained the past few months to run a faster 50k. I did - at 4 hrs and 8 min - I hit a "PR" for the 50k distance -although a little flatter than the 50ks I normally run. At 4 hrs and 20 min, I had slowed to a walk, and kept walking until close to the end. With about 15 minutes left, I found out I had 38.35 miles. At that point, I decided that I could run out the clock and try to get over 40 - that sounded good. 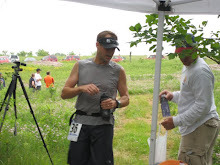 I did not stick to my hydration/nutrition plan which I'm sure was my downfall in the race. Simply, I did not stick to the calories and water I needed to get through the run. Thanks to all who came out - Dave, Steph and her dog, cousin Matt, Bill, Jean and others - especially to Dave who tried to keep my spirits up around that 4:30 mark. Sorry I couldn't keep up Dave! Not to mention tough as nails Beth, who ran 105.87 miles in the 24 hr event - who when she saw me walking let me know to "keep moving forward until the end!" Congrats to her for reaching her goal - 100 miles in 24hrs is outstanding! !